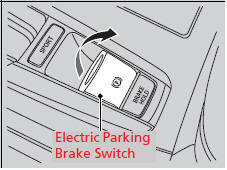 - The electric parking brake indicator comes on for 15 seconds when you pull up the electric parking brake switch. If you live in a region where winter is extremely cold, an engine block heater will improve starting and warming of the engine. If temperatures consistently below -22°F (-30°C) are expected, the coolant mixture should be changed to a higher concentration to prevent freezing. Consult a dealer for details. If exhaust system sounds abnormal or you can smell exhaust gas inside the vehicle, have your vehicle checked by a dealer. There may be a problem with the engine or exhaust system. If an improperly coded device is used, the engine’s fuel system is disabled. The engine may not start if the keyless access remote is subjected to strong radio waves. If the engine does not start, wait at least 10 seconds before trying again. 1. Keeping your right foot on the brake pedal, put the shift lever in . Select when reversing. 2. With the parking brake applied, release the brake pedal and gently depress the accelerator pedal. - Make sure the electric parking brake indicator goes off. 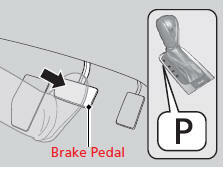 Move the shift lever to when facing uphill, or when facing downhill, then release the brake pedal.